SANTA CLARA, Calif., Apr. 2, 2019 – At Intel’s “Data-Centric Innovation Day,” the company revealed next-generation processors and platform technologies to unleash the impact of data for customers across the globe. Today’s announcements reflect Intel’s unmatched product portfolio to move, store and process data across the most demanding workloads, from the intelligent edge to multi-cloud and back. The 2nd-Gen Intel Xeon Scalable platform provides the foundation for a powerful data center platform that creates an evolutionary leap in agility and scalability. Enterprises, cloud and communications service providers can drive forward their most ambitious digital initiatives with a feature-rich, versatile platform. Support for Intel’s breakthrough Intel® Optane™ DC persistent memory, delivering up-to 36TB of system-level memory capacity when combined with traditional DRAM. Intel® Turbo Boost Technology 2.0 ramps up-to 4.4GHz, alongside memory subsystem enhancements with support for DDR4-2933 MT/s and 16 Gb DIMM densities. Enhanced Intel® Infrastructure Management Technologies to enable increased utilization and workload optimization across data center resources. As part of Intel’s ongoing commitment to protect customers and their data, new side-channel protections are directly incorporated into hardware with the introduction of the 2nd-Gen Intel Xeon Scalable processors. 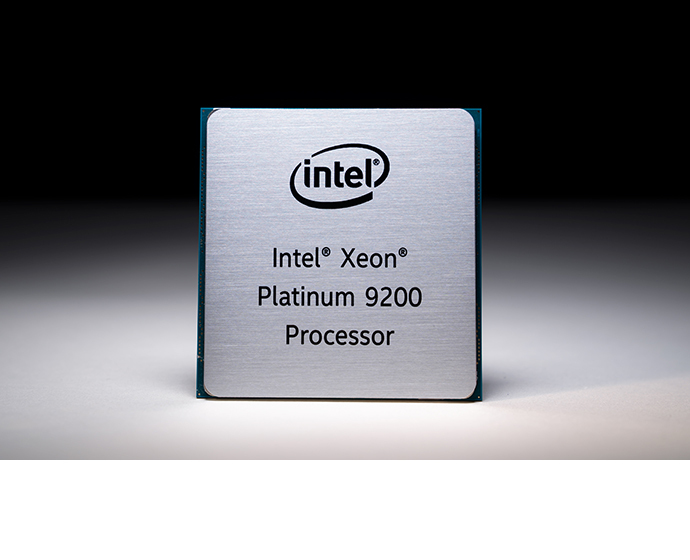 The Xeon Scalable Platinum 9200 processor is designed for high-performance computing (HPC), advanced analytics, artificial intelligence and high-density infrastructures. The new Intel Xeon Platinum 9200 processors feature up to 56 cores and 12 memory channels to deliver breakthrough levels of performance with the highest Intel architecture FLOPS per rack, along with the highest DDR4 native memory bandwidth support of any Intel Xeon processor platform. Intel Turbo Boost Technology and Intel® Hyper-Threading technology. Delivering the powerful performance and ultimate scalability that advanced workstation professionals demand, the 2nd-Gen Intel Xeon Scalable processors for workstations are optimized for purpose-built platforms designed for heavily threaded, I/O intensive workloads across market segments such as architecture, engineering, construction (AEC), media and entertainment, artificial intelligence, oil and gas, and life sciences. Released in conjunction with 2nd-Gen Intel Xeon Scalable processors, Intel Security Libraries for Data Center (Intel® SecL-DC) is designed to simplify the integration and deployment of hardware-rooted Intel security technologies at cloud scale. Intel SecL-DC brings optimized programming interfaces and management tools for many Intel security technologies together in one easy-to-use set of libraries and tools compatible with cloud environments like OpenStack, Docker and Kubernetes* Extensions. Intel SecL-DC strengthens Intel’s commitment to protect data throughout its lifecycle – at rest, in flight and in use. Intel enhanced its 2019 portfolio of Intel Select Solutions to simplify and accelerate customer deployment of workload-optimized infrastructure and faster time to value. The portfolio features nine new or updated solutions configurations available today and six additional configurations coming soon to market. The configurations are optimized to take full advantage of the latest data-centric product enhancements, plus updates of existing configurations that utilize 2nd-Gen Intel Xeon Scalable processors. With these additions, Intel will offer a total of 21 Intel Select Solutions. Highlights of the Intel Select Solution portfolio launched today include new solutions for SAP HANA, Visual Cloud Delivery Networks, AI Inferencing, and HPC and AI Converged Clusters, as well as updated solutions for foundational workloads such as Microsoft SQL Server, NFVi, VMware vSAN* and Microsoft Azure Stack HCI*. Intel has more than 35 partners currently offering solutions or that plan to build, verify and sell new 2nd-Gen Intel Xeon Scalable processor-based solutions in the future. Greater data confidentiality through VM memory encryption and cache isolation. Robust platform integrity with trusted boot all the way through to runtime. And Improved availability through more deterministic Quality of Service and protections from Noisy Neighbors, whether malicious or not. Together, this delivers a benchmarked and optimized platform, which removes guess work and streamlines time to deployment. Intel Xeon D-1600 processors are highly integrated SoC processors designed for dense environments where power and space are limited, but per-core performance is essential. Combined with built-in Intel® QuickAssist technology and Intel® Virtualization technology, Intel Xeon D-1600 processors deliver new levels of workload-optimized performance and hardware-enhanced security benefits for virtualized network functions (VNFs), control plane and mid-range storage solutions. Intel Xeon D-1600 processors feature up to 8 cores. Compute Express Link, a cache and memory coherent interconnect to future Intel Xeon Scalable processors. The Intel Agilex FPGAs utilize Intel’s heterogeneous 3D packaging technology, which provides FPGAs with application-specific optimization and customization, delivering new levels of flexibility and agility. With breakthrough performance levels in memory-intensive workloads, virtual machine density and fast storage capacity, Intel® Optane™ DC persistent memory – combined with 2nd-Gen Intel Xeon Scalable processors – accelerates IT transformation to support the demands of the data era, with faster-than-ever analytics, cloud services, virtualization and next-generation communication services. Intel Optane DC persistent memory provides a new foundation for data center performance, delivering up to 36TB of system-level memory capacity when combined with traditional DRAM. Intel Optane DC persistent memory allows customers to transform critical data workloads – from cloud and databases to in-memory analytics and content delivery networks. The dual-port Intel Optane DC SSD D4800X (NVMe) offers a “24×7” available data path and super-fast storage, breaking through bottlenecks to increase the value of stored data in mission-critical environments. The Intel Optane SSD DC D4800X delivers 9x faster read latency compared to NAND dual port, under write pressure. The Intel® SSD D5-P4326 (QLC 3D NAND) is an addition to the industry’s first-to-market PCIe QLC SSDs and available on the industry’s first EDSFF compliant drive. The drive and innovative “ruler” form factor delivers massive, cost-effective capacity SSDs to enable HDD and TLC SSD replacement in warm storage. Using QLC in warm storage delivers storage consolidation and cost savings across content-delivery networks, data lakes, scale-out storage and large media stores. Learn about Intel’s storage innovations and how the company is driving data-centric transformation. More information on Intel® 3D NAND technology can be found on Intel.com. The Intel Ethernet 800 Series controllers and adapters, in production in 2019’s third quarter, are capable of supporting speeds of up to 100 Gbps, which is 4x to 10x more server network bandwidth than many companies have deployed today. The new Ethernet series provides breakthrough capabilities including Application Device Queues (ADQ), which improves application performance and consistency in meeting service-level agreements (SLAs). ADQ delivers greater than 50 percent increase in application response time predictability3 , more than 45 percent lower latency4 , and more than 30 percent improved throughput5 running open source Redis*, a widely used database among cloud service providers. Other advanced capabilities include enhanced Dynamic Device Personalization (DDP) to improve packet processing efficiency and enable new services, and faster processing of latency sensitive workloads with support of both iWARP and RoCE v2 Remote Direct Memory Access (RDMA).